Bottoms of the shoes are dirty. Outsides of the shoes have only light wear. Insoles of the shoes are in good condition. Length (heel to toe)- 10.25". Insoles- 10". Bottom soles has light wear and light dirt. Along the sides of the shoes are clean and show no dirt. The insoles are clean. Shoes are in pre-owned condition and show signs of light wear. Insoles:10". (Good condition, good to go :). photos may very slightly in color due to monitor settings and or lighting but are generally close as can be to showing authentic color of the item, also my eyes see colors similarly but not exactly like everyone else as is common, when I say the shoes are a certain color it is possible I could be off by a shade or two based on personal speculation. Material of shoe is worn but clean, creasing over toes of both shoes. Pre-owned shoe with normal wear. Shoestring is frayed on right shoe. shoe still has wear left. Bottoms still have good tread with light dirt marks, as well as inner and outer soles. Mid Grey / silver. Rearfoot and Forefoot Gel Technology Cushioning System. Impact Guidance System Technology. Guidance Trusstic System Technology. Note - says sales sample under tongue. Heel Clutching System Technology. Condition: Good used condition.These shoes are marked as a size 7, but wear like a size 6. There is also the number "11" lightly marked on both heels. Otherwise, they are great shoes in very good used condition. Shoes are in pre-owned condition and show signs of normal wear. The toe of the left shoe has a small stain. Width: 4.25". Insole:10". Heel to Toe: 10.5". The GEL Nimbus 19 runs a half-size smaller than previous models. With the new FlyteFoam Technology that provides great cushion with reducing the weight makes this shoe a great selection. 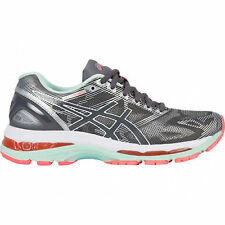 The unequaled Asics GEL cushioning provides the buffer you need for your heel and forefoot. Guidance Line from the heel to forefoot for improved gait efficiency. ASICS High Abrasion Rubber (AHAR) in the heel for durability. Bright Rose/Bright Rose/Apricot Ice. FluidRide for responsive cushioning with reduced weight and increased durability. A smooth, comfortable ride that's 20 years in the making. ColorIndigo Blue/Blue/Opal Green. Size7 D(W) US. Bottom soles are slightly dirty. Shoes are pre-owned with light wear. Very light dust along sides of shoes. Shoes are in excellent condition. Toes and back heels are clean. Insole and inner lining are clean. Bottom soles are slightly dirty, no wear to treads. Shoes are pre-owned with signs of light wear. Shoes are in excellent condition. Toes, sides, and back heels are clean, no sign of dirt. Insole and inner lining are clean. These pre-owned Asics running shoes are in very good condition. Size US 7 | EU 38 | CM 24. Insoles are fairly clean from gentle use. Bottom soles are slightly dirty. Very light marks along the sides of shoes. Shoes are in great, pre-owned condition. Length (Heel To Toe): 11". In very good overall shape. No tearing in the heels, lots of life on the soles. Preowned in good condition with minor wear on the sides of the shoes and moderate wear on the bottoms. Very good pre owned condition with small tears on the inside heels. Where appropriate, I also provide a close-up photo of any problem area. Excellent used condition (9.5/10.0). Minor signs of wear on outsoles. Overall, pretty clean shoes. See pictures for detail. Color - Turquoise / Blue. Style - Running, Training Shoes; Athletic Sneakers. If you are dissatisfied with your item or have any concerns. STYLE: 1012A189. COLORS: MID GREY / ILLUSION BLUE. Rearfoot and Forefoot Gel Technology Cushioning System. LITE-SHOW TRAIL RUNNING SHOES. Heel Clutching System Technology. Rearfoot and Forefoot Gel Technology Cushioning System. Black with white. Impact Guidance System Technology. Guidance Trusstic System Technology. Note - says sales sample under tongue. Heel Clutching System Technology. Sides are clean, no dirt. Length (heel to toe)-10.75". Bottoms are slightly dirty, tread is not worn down or uneven.